Sicily, well-known for its charming landscapes, its historical and artistic heritage, its culinary tradition, will welcome you with its unique colours, flavours and smells. In step with your wishes, Villa Lina is a peaceful spot in one of the most uncontaminated coast of Sicily. Located in a quiet private residence called “Parco degli Aranci”, the house and its atmosphere will make your stay enchanting. Everything is organized to provide enjoyment, comfort and relax both for adults and children. The external area, surrounded by flowers and Mediterranean plants, is furnished with loungers, a comfortable porch swing for three people, a big wooden table with four chairs, an efficient BBQ area, a bench, another table with chairs and sun umbrella. The veranda has also an external shower, very comfortable when you come back from the beach. Villa Lina has two bright colourful bedrooms, one bathroom with shower, a spacious lounge/dining area and a fully equipped kitchen. The living room is provided with satellite TV, DVD player and radio; The house is also furnished with Internet with WI FI. The great cosy convivial spaces of the house, the tranquillity of the place and the surrounding natural wonders will make your Sicilian experience unforgettable! Moreover, the owners will offer you a free trip of the coast by boat during the summer season (21/06/2014 - 20/09/2014), if the weather and sea sea are good. Of course you should agree upon with the owners days before. For additional information see the Facebook page "Villa Lina affitti casa al mare by Daniela "
This is a small home but so beautifully decorated and cared for. Daniela is lovely! The house is in a safe gated community. Parking is safe for rental car. We were there at end of October and Seccagrande was a bit deserted, leaving nearest Supermarket in Ribera about 5 miles away. WiFi was excellent. The outdoor space is exactly as photos show. Really enjoyed relaxing outside. Area of Sicily is quiet , but very beautiful. Beaches looked lovely. Well equipped property close to the sea. We found Seccagrande to be a very pleasant, low key seaside village with pebbly beach and inviting sea. The villa had everything we needed, plus plenty of outside eating and relaxing areas. Ideal get away for couples or a couple with a young child young child.as garden area is totally secure. Near to wonderful beaches and stunning scenery. More than comfortable accommodation with plenty of outdoor space to sit in the shade and relax. La casa di presenta molto ordinata, spazi ben organizzati e tanta tranquillità. Bello e curato il giardino, qui si può riposare sopra l'amaca anche d'inverno! We had a lovely stay with our little daugther in this little paradise. Daniela is superhost. When we arrived we received a basket with fruits and everything you need was available in the house. The livingroom and kitchen outside were very convenient and comfortable. The house is close to a small supermarket and very close to the beach. Not far from seccagrande you will find the most beautiful beaches which are also recommended by Daniela. We really loved our stay here and would really recommend it! We had a very enjoyable stay at Villa Lina and the owner Daniella could not have been more helpful and welcoming. The location is great for exploring the island and there are some beautiful quiet beaches a short drive away. The house is very well equipped, with everything you could possibly need and the outdoor area is just lovely. I would recommend Villa Lina for a nice relaxing holiday in lovely Sicily. Villa Lina is situated on a hillock opposite to the sea in Seccagrande, a hamlet of Ribera. 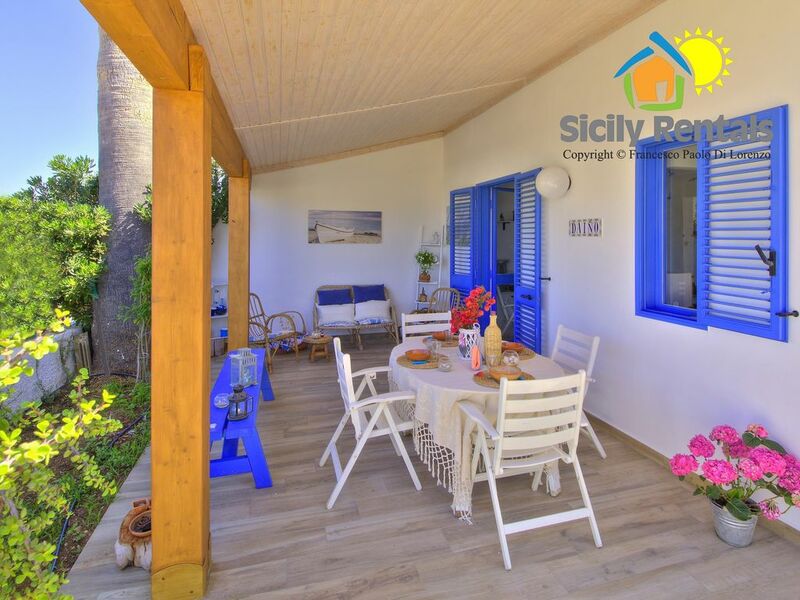 The house is only few steps away from the sea and from the town centre, where a lot of bars, restaurants, pizzerias and markets make this nice village a little lively town during the summer season. Unimaginable natural paradises, uncontaminated long white sandy beaches, natural reserves with special wildlife conservation will distinguish your holiday here. Ribera, known as “City of orange” for its international oranges production all over Europe, is a very eventful town. The pleasant summer nights are livened up by culinary feasts, music entertainments, cultural festivals and a lot of other events. Moreover, the town has recently got the acknowledgement of “City slow”, thanks to its care in improving citizens’ and guests’ wellness. “Torre Salsa”: a natural masterpiece protected by WWF, located between Siculiana Marina and Eraclea Minoa. Its peculiarity are the chalk and clay cliffs and the very bright sea, whose bottom is marked by a rich blooming flora and fauna. The six kilometers of wild nature encompass jagged shores, golden and secluded beaches, sandy dunes and uncontaminated paths which will fascinate sea and nature lovers. It is a real singular white cliff made by limestone and clay which rises along the coast of Realmonte and overlooks a crystalline sea. Its name comes from the Turkish invasions, since the legend says that Saracens got there from the sea and climbed the cliff to reach the near villages and attacked them. It has became a tourist attraction for its particular color and shape; wind and rain have modeled it throughout the time, creating a huge natural staircase whose lines are rounded and irregular. Its white rocks look brighter thanks to the sun light and the water is incredibly clear.. it’s a paradise! In less than 40 minutes driving, you can reach one of the most suggestive attraction of Sicily: the Valley of the Temple. It rises in the southern part of the old city of Agrigento and is considered the biggest archaeological park in the world. Among a blooming almond trees countryside, the wonderful ruins of the temples, whose architectural majesty is still intact, will fascinate you.